The wide variability in the expression levels of recombinant proteins in Escherichia coli remains a major challenge for biotechnologists. While some proteins are routinely expressed at 30-40% of total cellular protein (TCP) (Joly and Swartz 1997; Kim et al. 2003; Suzuki et al. 2006), others may reach a maximum of only 5% of TCP (Kiefer et al. 2000). The uses of strong promoters, removal of codon bias and media design are favored strategies for improving recombinant protein yield (Acosta-Rivero et al. 2002; Hale and Thompson 1998). It is important to note that most scale up strategies involving high cell density cultures tend to increase biomass concentrations and hence volumetric product concentrations rather than the specific product yield in terms of product formed per unit biomass (Yp/x). This yield remains an intrinsic property of the host-vector-gene combination used for expression. Improvements in host vector systems has tended to focus on developing high copy number plasmids with strong tightly regulatable promoters (Bowers et al. 2004; Jones et al. 2000; Wild and Szybalski 2004) along with protease free and recombination deficient strains (Meerman and Georgiou 1994; Ratelade et al. 2009). The focus has thus primarily been on enhancing the metabolic flux of the recombinant protein expression pathway, with few studies on analyzing how the gene products interact with the host cell machinery to depress its own expression. It has been routinely observed that the specific growth rate of recombinant cultures declines post induction. Earlier authors had correlated this decline to be a measure of the metabolic burden associated with recombinant production (Bentley et al. 1990; Seo and Bailey 1985). It was postulated that the availability of critical metabolites was reduced since they were diverted to product formation, leading to a concomitant decline in the specific growth rate (Babaeipour et al. 2007). It is therefore to be expected that the decline in growth should be most severe when expression levels are maximum. However in most cases there seems to be no such correlation since severe growth retardation is observed when some proteins are expressed in fairly low amounts (Bhattacharya et al. 2005) whereas high level expression of other proteins cause little or no growth retardation (Srivastava and Mukherjee 2005; Vaiphei et al. 2009). The metabolic burden hypothesis is also unable to explain the large variability observed in the levels of recombinant protein yield. Recent studies on the transcriptomic profiling of recombinant cultures has improved our understanding on the nature of cellular stress associated with over-expression of recombinant proteins (Haddadin and Harcum 2005). Global regulators are triggered in response to induction and these in turn up/down-regulate sets of genes involved in a range of cellular functions (Perez-Rueda and Collado-Vides 2000; Perrenoud and Sauer 2005). These include genes for central carbon metabolism glycolysis, Entner-Doudoroff pathway, pentose phosphate pathway (PPP), tricarboxylic acid (TCA) pathway, glyoxylate shunt (GS), respiration, transport, anabolism, catabolism and macromolecular degradation, protein biosynthesis, cell division, stress response, flagellar and chemotaxis system. This coordinated response of the host mimics many features of the heat shock, osmotic shock, oxidative stress and stringent responses (Gill et al. 2000; Kurland and Dong 1996). This results in the decline of both growth and product formation rates. Thus transcriptomic data reveals a more complex picture of the host response where the cell dynamically reacts to the stress associated with recombinant protein expression. In this work we have tried to extend this analysis by two ways. Firstly we have mimicked industrial scale fermentation where complex media is used to obtain a combination of high cell densities along with high specific growth rates. The latter allows high specific product formation rates and thus product yields are significantly higher in complex media. The transcriptomic profiling of such cultures could provide a more meaningful picture of the cellular physiology under conditions of hyper-expression. We have also attempted to overcome the problems of monitoring cultures grown in complex media by online measurement of metabolic activity like OUR, CER, etc. Secondly we have looked at the variability in cellular stress responses as a function of the nature of the expressed protein. For this we choose three proteins viz. rhIFN-β, Xylanase and GFP, where the bioprocess parameters for high level expression has been previously optimized in our lab. A primary reason for choosing these three proteins was to analyse the difference in the transcriptomic profile when two soluble proteins were expressed under different expression systems and also to see the variability in the cellular response when expression is in the form of inclusion bodies (rhIFN-β) or as a soluble protein (xylanase). In all these cases there is a large diversion of the metabolic flux towards recombinant protein synthesis and thus according to the 'metabolic burden' hypothesis the cellular stress response should be similar. However we observed significant difference in the up/down regulation of genes demonstrating that the cellular response is a function of the gene product and the expression system used. Media and bulk chemicals were purchased from local manufacturers, Himedia, Qualigens, and Merck. Media used were LB (Luria-Bertani media containing yeast extract 5 g, tryptone 10 g, and NaCl 10 g/L, pH 7.2), TB (Terrifc broth containing yeast extract 24 g, tryptone 12 g/L, and 0.4% glycerol, pH 7.2). IPTG (1 mM), ampicillin and chloramphenicol were from Sigma, USA. Restriction and modifying enzymes were purchased from MBI Fermentas. All other chemicals were of analytical grade and obtained from local manufacturers. Escherichia coli strain BL-21 (DE3) [(F- ompT hsdSB(rB- mB-) recA1 gal dcm _(DE3) (lacI lac UV5-T7 gene 1ind1 Sam7 nin5)] was obtained from Novagen, USA. Strain DH5α (supE44 _lac U169 (_80 lacZ _M15) hsdR17 recA1 endA1 gyrA96 thi-1 relA1) was obtained from Amersham Biosciences, USA. Plasmid pET22b (AmpR) was from Novagen, USA, pRSET B (AmpR) from Invitrogen, Netherland and pBAD33 (ChloramphenicolR) from J. Beckwith, USA. rhIFN-β gene was inserted downstream of the T7 promoter in a pET22b expression vector and transformed into E.coli BL-21(DE3) cells. rhIFN-β gene was synthesized using SOEing PCR where all the non optimal codons were replaced with optimal codons. The complete xylanase gene fragment was amplified using M13 forward and XylR primers and a hexahistidine fused xylanase was cloned into the pRSET B vector. This construct was named pRSX and showed soluble cytoplasmic expression. Cloning of GFP gene into pBAD33 was done by digesting pET14b-GFP (obtained from ICGEB, India) with enzymes Xba I and Hind III and ligating it into plasmid pBAD33 (which does not contain any ribosome binding site). GFP was cloned under the ara promoter which is a tightly regulated promoter. A freshly transformed single colony of each clone was inoculated in 10 ml Terrific Broth (TB) containing 100 μg/ml (1×) ampicillin and grown over night. This culture was used to inoculate 200 ml TB having the same antibiotic concentration and grown further for 8 h (OD~ 7). This was used as an inoculum for the fermenter (Sartorius Biostat B Plus) containing TB medium & 1× antibiotic. Temperature, pH and initial Dissolved Oxygen (DO) were set at 37°C, 7.0 and 100% respectively with the initial stirrer at 250 rpm. DO was cascaded with stirrer and maintained at 40%. The airflow rate was kept at 2 l/m. The medium pH was set at 7.0 and controlled by automatic addition of 1 N HCl or NaOH. Sigma Antifoam 289 was added when required. The feeding solution which comprises 12% peptone, 12% Yeast Extract and 18% Glycerol was fed so as to maintain the pre-induction μ at 0.3 h-1. The culture was initially grown in a batch mode till 10-12 OD and then the feed was attached. In order to support the growth at a constant specific growth rate of 0.3 h-1, the feed rate was increased exponentially using the equation F = Foeμt, where Fo is the initial flow rate, F is the flow rate at any given time, μ is the specific growth rate and t is time in hours. Simultaneously, the metabolic activity of the cultures was estimated indirectly by observing the Oxygen Uptake Rate (OUR) and Carbon Emission Rate (CER) which was measured by an exit gas analyser (FerMac 368, Electrolab Ltd, Tewkesbury, UK). RPM is also a useful online indicator of the oxygen transfer rate which matches the oxygen uptake rate (OUR) when dissolved oxygen is at steady state. Since throughout the experiment, dissolved oxygen was maintained at 40% by cascading RPM with dissolved oxygen, we could correlate these parameters with the metabolic activity of the culture (Gupta et al. 1999). Thus a plot of OUR versus RPM2, gave a straight line (Additional File 1) and this provided us with a cross check on the measured values of OUR. This was used to estimate the online metabolic activity of the culture post induction which allowed us to design the post induction feeding strategy without allowing substrate buildup in the media. From the pH profile it was ensured that there was no acetate accumulation and both acetate and glycerol levels were monitored using the Megazyme Acetic Acid kit (KACETRM; Megazyme International Ireland Limited) and using the Megazyme Glycerol kit (K-GCROL; Megazyme International Ireland Limited) respectively, to confirm that there was no overflow metabolism. Samples from fed batch fermentations of rhIFN-β, Xylanase and GFP were collected at four time points (0 h, 2 h, 4 h, and 6 h) after induction. 0 h (uninduced) samples were taken as a control for every run. The cDNA synthesis, labelling (biotin) and hybridization (Affymetrix GeneChip E.coli genome 2.0 array) were performed according to the Affymetrix GeneChip expression analysis protocols. Washing, staining and amplification were carried out in an Affymetrix GeneChip® Fluidics Station 450. Affymetrix GeneChip® scanner 3000 was used to scan the microarrays. Quantification and acquisition of array images were done using Affymetrix Gene Chip Operating Software (GCOS) version 1.4. Three types of detection call (i.e., present, absent, or marginal) were calculated using statistical expression algorithm and average normalization was performed. Hybridization and spike controls were used. Subsequent data analysis was performed using GeneSpring GX11.5 software (Agilent Technologies, USA). RMA algorithm was used for data summarization (Bolstad et al. 2003) and quality control of samples was assessed by principle component analysis (PCA). Fold change was calculated as time point/uninduced control (0 h). Normalized signal intensities of each gene on chips were converted to log2 values, and compared between experiments. The microarray data series of fed batch runs have been deposited to the Gene Expression Omnibus database at NCBI under the accession number GSE28412 for rhIFN-β (GEO; http://www.ncbi.nlm.nih.gov/geo/query/acc.cgi?acc=GSE28412), GSE29439 for xylanase (GEO; http://www.ncbi.nlm.nih.gov/geo/query/acc.cgi?acc=GSE29439) and GSE29440 for GFP (GEO; http://www.ncbi.nlm.nih.gov/geo/query/acc.cgi?acc=GSE29440). The data set was filtered and genes with ≥ 2 fold change were selected for further analysis. The comparison was done across all time points for all 3 sets of recombinant protein and the common set of up/down-regulated gene were used for further analysis. The comparison set is shown as a Venn diagram in Additional file 2a. To analyze the similarities in the response to rhIFN-β, Xylanase and GFP production, common genes in all the three gene sets were extracted and shown in Additional file 2b, e and Additional file 3. Next, to analyse the effect of hyper-expression of recombinant protein under a strong promoter, the list of genes that were exclusively up/down-regulated in the time course profiles of rhIFN-β and Xylanase but not in GFP were extracted from the Venn diagram as shown in Additional file 2.c, f and Additional file 4. Similarly to analyse the effect of heterologous soluble protein expression on host cells the time course expression profile of Xylanase and GFP were analysed and the genes that were solely up/down-regulated in these two sets and not in rhIFN-β (expressed as inclusion body) were picked up (Additional file 2d, g and Additional file 5) for further studies. 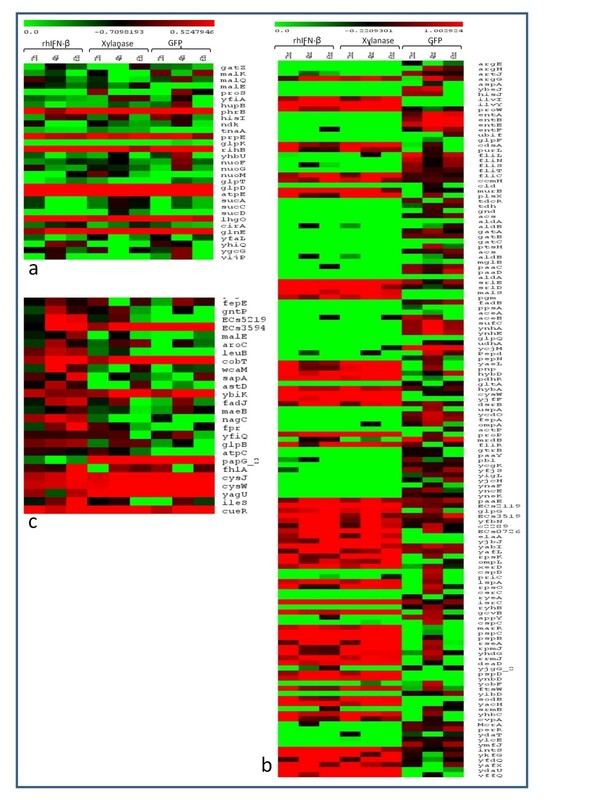 Gene expression values of the above three sets are represented in the form of heat map in Figure 1. Heat maps comparing the expression profiles. a) Set of genes present during expression of rhIFN-β, xylanase and GFP. b) Set of genes affected during rhIFN-β and xylanase production but not in GFP. c) Set of common genes present during expression of GFP and xylanase but not in rhIFN-β. In this work rhIFN-β was expressed as an inclusion body whereas xylanase and GFP were expressed as soluble proteins. While rhIFN-β and xylanase were expressed under a strong promoter (T7) in E.coli BL21 (DE3) cells, GFP was expressed under the ara promoter in an E.coli DH5α strain. Cells were grown exponentially in the bioreactor at a specific growth rate of 0.3 h-1 by using an exponential feed of complex media and induction was done at an OD between 20-25. At this point the feed rate was ~40 ml/h and the OUR was 0.27 moles/l/h, with a Respiratory Quotient (RQ) of 1.1. Since the biomass yield (Yx/s) on glycerol, while using complex nitrogen sources had been previously determined to be between 1-1.1 g/g. The above results matched stoichiometrically and demonstrated complete consumption of substrate feed. A continuous fall in the specific growth rate was observed which dropped to zero within 4 hours of induction. In the post induction phase continuous increase in the OUR was observed which necessitated oxygen supplement of the inlet air after 1 h of induction. From the on-line metabolic activity measurement we could identify 3 phases in the metabolic activity of the culture. In the first phase from the point of induction till 2 hours the activity as measured by OUR, CER and RPM2 kept increasing, even though there was continuous decline in specific growth rate. Clearly a large part of this metabolic activity was diverted towards maintenance (Russell and Cook 1995). The specific product formation rate was high during this period. Since the metabolic activity doubled in this period, the post-induction feed was also increased concomitantly (Ramalingam et al. 2007). In the second phase between 2 to 4 hours the feed was kept constant since the on-line measurement indicated a constant metabolic activity. Finally after 4 hours there was a decline in metabolic activity and the specific product formation rate declined to reach zero in 6 hours. Samples were collected to represent these three phases 2, 4 and 6 hour (post-induction). Figure 2 shows the SDS-PAGE gel picture of rhIFN-β, xylanase and GFP expression profile post induction. SDS-PAGE gel picture showing total cellular protein from fed-batch culture in TB medium. a) rhIFN-β. b) GFP c) Xylanase. Same marker lane has been used for 1(a) and 2(b). The transcriptomic profiles of three different fermenter runs with rhIFN-β/BL21 (DE3), Xylanase/BL21 (DE3) and GFP/DH5α were analyzed post induction and genes with an expression fold change ≥2 with respect to the point of induction were chosen for further analysis. From these, the common list of genes with a high fold change across all time points and across all three fermenter runs was identified (Additional file 3). We observed that in all the three cases, the genes associated with metabolic activity in terms of carbon utilization and energy generation pathways were severely down-regulated. 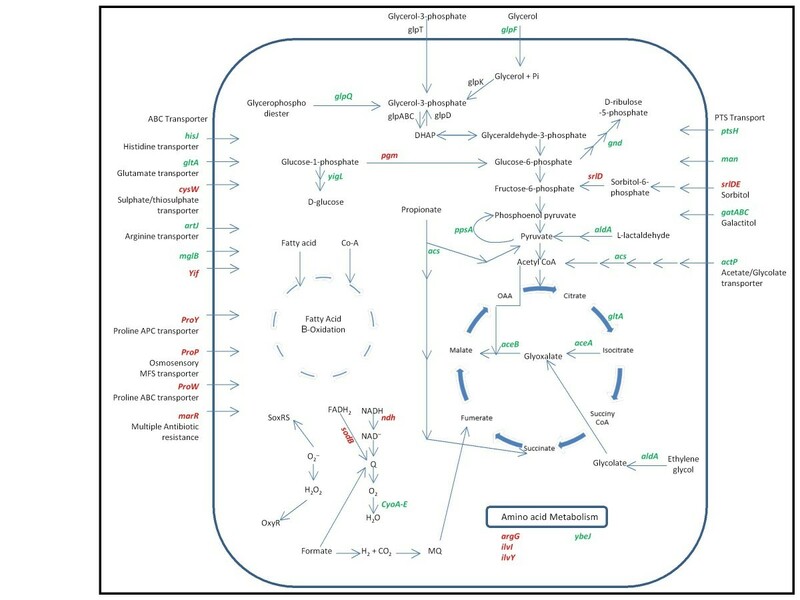 This was similar to earlier reports, where the expression of plasmid based proteins caused a down-regulation of genes involved in biosynthetic pathway, energy metabolism and central carbon metabolism (Ow et al. 2010). Among the existing transport systems involved in nutrient uptake in E.coli, two major components of the glycerol uptake system are glpT (Glycerol-3-phosphate transporter) and glpK (Glycerol kinase). Both these were down-regulated 3.7 and 5.6 folds respectively. Oh and Liao (2000) have also reported that when glycerol was used as a carbon source, under nutrition limitation, genes involved in glycerol catabolism were down-regulated. We also observed that maltose transporters malT, malE and malK were repressed with a concomitant up-regulation of mlc which negatively regulates the ATP-binding component of the maltose ABC transporter (Plumbridge 2002) similar to observations of Lemuth et.al. (2008), which indicates that transport of carbon sources were significantly affected. The transcript levels of a number of aerobic respiration proteins involved in ATP synthesis were found to be relatively lower. The genes of the nuo operon encoding for components of NADH dehydrogenase-I were down-regulated. NADH: ubiquinone oxidoreductase-I (NDH-1) is an NADH dehydrogenase which is part of both the aerobic and anaerobic respiratory chain of the cell (Hua et al. 2004). It was found that the ndh and genes of the atp operon were down-regulated in line with previous observations (Durrschmid et al. 2008; Haddadin and Harcum 2005). In addition, expression of two main aerobic terminal oxidases, cytochrome bd (cydAB) and cytochrome bo (cyoABCD genes) were also reduced (Oh and Liao 2000). Concomitantly we observed a severe down-regulation of genes involved in TCA cycle (icdA, aceBAK, acs) and amino acid synthesis which can be attributed to the cellular stress associated with the over-expression of recombinant proteins. sucABCD operon of TCA cycle was down-regulated and this may be due to the repressor activity of ArcA/ArcB, which is known to act on aerobic central metabolism pathway during oxidative stress (Vemuri et al. 2005). Both glpD, which catalyses the conversion of glycerol-3-phosphate to dihydroxyacetone phosphate, and prpE, a key enzyme in propionate degradation were up-regulated 10.4 fold and 5.4 fold respectively. 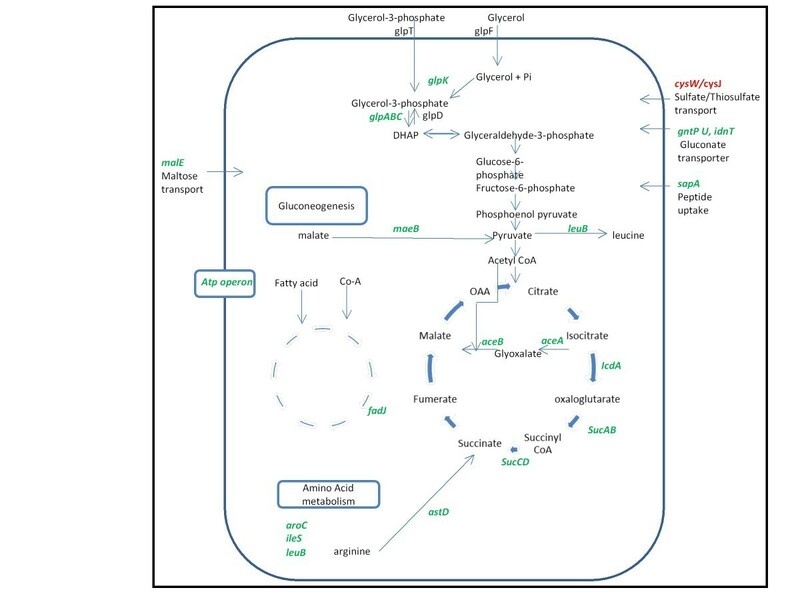 This indicates that alternative pathways for substrate utilization are active during stress, and act as anapleurotic reactions to replenish TCA cycle metabolites. gatZ is involved in galactitol degradation which catalyze the dissociation of D-tagatose 1, 6-biphosphate to glycolytic intermediates (Nobelmann and Lengeler 1996). This gene was observed to be down-regulated, indicating that potential anapleurotic pathways which are energy consuming are down-regulated in order to conserve energy. Interestingly there was also down-regulation of tnaA which breaks down L- tryptophan and L- cysteine to pyruvate. This shows that while the overall flux in the glycolytic pathway is decreased, a cascade of events also takes place to maintain the pool of critical intermediaries inside the cell. We can therefore hypothesize that the cell ensures its supply of nodal metabolites while it reprogrammes its machinery upon induction of metabolic stress. The schematic of the processes and reactions catalyzed by this common set of differentially expressed genes is given in Figure 3. Schematic diagram showing common genes which were up/down-regulated (fold change ≥ 2) during rhIFN-β, xylanase and GFP production, along with the processes and reactions they are involved. Red and green colour letters represent up-regulated and down-regulated genes respectively. The set of genes which were found to be up/down-regulated (fold change ≥ 2) during high level expression of rhIFN-β and xylanase under the T7 promoter, but not in the relatively lower 'ara' based expression of GFP were analysed to understand the host response towards hyper-expression of proteins (Figure 4, Additional file 4). The processes of cell growth and expression of foreign gene products both compete for the use of various intracellular resources for the biosynthesis, of amino acids, nucleotides as well as metabolic energy. When recombinant proteins are over-expressed under strong promoters, a major chunk of the flux of the precursors are diverted towards heterologous gene expression (Chou 2007). This gross imbalance in the resource distribution leads to degradation of cellular health and the cellular physiology is significantly reprogrammed. We thus observed that this list contained the maximum number of up/down-regulated genes. This included the major channels of precursor molecules like transporters (artJ, mglB, hisJ, ybeJ, ptsH, sufC, ycdO, gatA, gatB, gatC, fepA, ompA, actP and mrdB), central intermediary metabolism (pdhR, aceE, aceF, lpdA, and gltA), amino acid metabolism (argE, argH, entA, entB, entE, entF, aspA and ubiF) and energy generation pathways genes which were down-regulated. glpF, the glycerol facilitator, which helps in facilitated diffusion of glycerol across the inner membrane of the cell was found to be down-regulated 3 fold. Down-regulation of glycerol transport and utilization pathway is a major bottleneck in achieving high yield of recombinant protein, and co expression of glpF with target protein has been reported to increase productivity (Choi et al. 2003). This is in agreement with the hypothesis that the cell restricts the supply of precursor molecules in order to slowdown metabolic fluxes and thus restricts foreign protein expression. We observed that the whole atp operon was down-regulated, supporting the fact that energy generation pathway are repressed during metabolic stress. Simultaneously the flagellar motility (fliL, fliN, fliS, fliT) genes were also found to be down-regulated. A steep proton gradient is required for flagellar motility between the periplasmic space and the cytoplasm; decreased motility could indicate energy deficiency. Probably, the cell strategically also down-regulates genes related to flagellar motility to minimize energy expenditure, which is in agreement with earlier data (Jozefczuk et al. 2010). The genes proW and proP help in maintaining osmotic homeostasis, prevent cell dehydration and restore membrane turgor (Gunasekera et al. 2008; Mellies et al. 1995). These were found to be 6.0 fold and 5.3 fold up-regulated respectively, which is in agreement with the fact that hyper-expression of recombinant proteins not only affects the biosynthetic pathways but also leads to the disruption of cellular integrity. Similarly, yaeL was up-regulated which is activated in responses to unfolded protein stress (Alba et al. 2002; Betton et al. 1996; Jones et al. 1997; Mecsas et al. 1993; Missiakas et al. 1996). The pnp gene which encodes for PNPase and has a role in mRNA degradation during carbon starvation (Kaplan and Apirion 1974, 1975), was observed to be up-regulated. Interestingly these proteases and genes for mRNA degradation were not differentially expressed in case of GFP expression indicating that under lower levels of recombinant protein expression these stringent responses were not generated. An interesting comparison of the transcriptomic profile could be made by looking at those genes which were up or down-regulated, when xylanase and GFP were expressed as soluble proteins but not during the expression of rhIFN-β (as IBs). In both cases there is a metabolic flux diversion towards product formation. However with soluble protein expression, an additional stress is imposed by the interaction of the soluble protein with the cellular constituents, which is absent when the product gets sequestered as IBs. This list of genes is given in Additional file 5 and a schematic representing the reactions and processes which are up/down-regulated are shown in Figure 5. Schematic diagram showing common genes which are up/down-regulated (fold change ≥ 2) during GFP and xylanase but not in rhIFN-β, along with the processes and reactions they are involved. Red and green colour letters represent up-regulated and down-regulated genes respectively. The amino acid biosynthetic genes, aroC coding for chorismate synthase, which is the key branch-point intermediate in aromatic biosynthesis, leuB and ileS were among the significantly down-regulated group. Genes involved in the anapleurotic pathways of TCA cycle intermediates astD, as well as the glycerol degradation genes encoded by glpABC operon which provides intermediaries to the glycolytic pathways were also down-regulated. The rate limiting steps of both glycolysis as well as TCA cycle were down-regulated which would result in retarded substrate utilization and energy generation pathways. sapA is well known as a peptide transporter which is part of the defence degradation system in E.coli (Parra-Lopez et al. 1993). Along with this ATP binding to SapD has also been shown to be sufficient for restoring K+ uptake in E. coli via its two Trk potassium transporters (Harms et al. 2001). 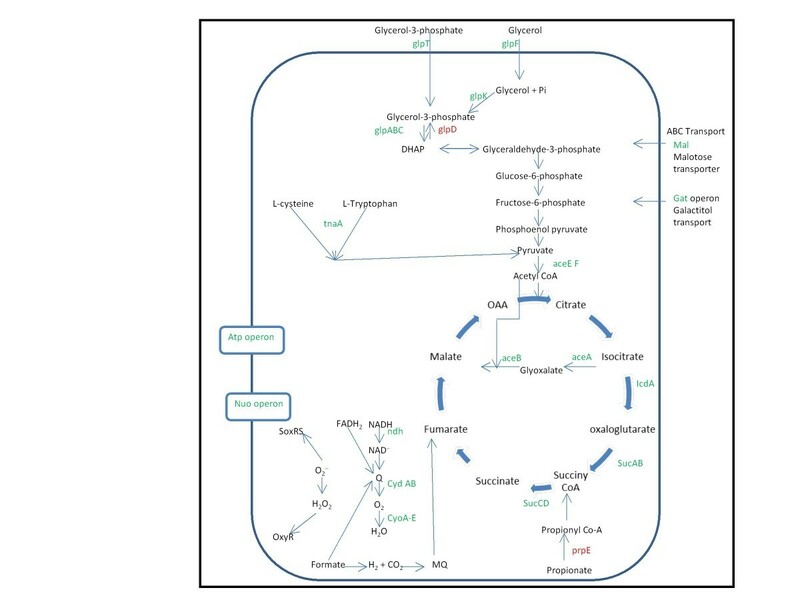 There was a significant down-regulation of sapA involved in potassium uptake in E. coli indicating that there is a decline in nutrient uptake and oxygen consumption rate of the cell (Harms et al. 2001). Similarly the fadJ gene which is a part of the anaerobic β-oxidation of fatty acids was also down-regulated suggesting that the cells were not able to use fatty acids as carbon and energy source (Campbell et al. 2003). In E. coli, fpr participates in the synthesis of methionine, dissimilation of pyruvate, and synthesis of deoxyribonucleotides. The latter two reactions are anaerobic processes. In all cases, fpr functions together with flavodoxin in the transfer of electrons from NADPH to an acceptor (Bianchi et al. 1995; Ow et al. 2006) and this was also found to be down-regulated. atpC component of ATP Synthase F1 complex was down-regulated. These results indicate that the expression of a soluble protein leads to an enhanced suppression of key metabolic pathways, adversely affecting the cellular health and productivity of the host. It was observed that the cellular response to the diversion of metabolites for product formation, is at multiple levels directed both at growth rate and protein production. Since growth rate and protein synthesis share common pathways, this stress response hits both processes simultaneously, affirming previous reports on the growth associated nature of recombinant protein production (Bentley et al. 1990; Shin et al. 1998). The stress response first affects the carbon uptake by down-regulating various transporters and this phenomenon was observed for all the conditions irrespective of the nature and level of recombinant protein expression. Simultaneously the carbon utilization and energy generation pathways starting from Glycolysis, TCA to electron transport chain were severely repressed resulting in decreased growth yield, product formation and viability of the cell population as has been shown by Hardiman et al. (2007). Interestingly, there was a significant time lag between this transcriptomic down regulation and its resultant phenotype. Thus the metabolic activity which is linked to substrate uptake rate fell only after 4 hours post-induction. The down-regulation of energy generating pathways also leads to a drop in growth rate (Kasimoglu et al. 1996; Troein et al. 2007) which was also observed in the present case. It has been previously reported that in complex medium, several genes of energy generating pathways such as hycB, cyoA, cydA, and ndh, were down-regulated, along with the ATP synthase gene (Oh and Liao 2000), which is similar to our observations. The addition targets of this metabolic stress response were the amino acid uptake, peptide uptake and amino acid biosynthetic pathways. Interestingly amino acid uptake and biosynthesis was significantly repressed only when soluble proteins were expressed under different promoters, whereas these pathways were not significantly affected when the recombinant protein was expressed as an inclusion body. We observed that hyper-expression of recombinant protein tends to generate a very strong response where several pathways are affected, most importantly the transporters and the cellular degradation machinery like the osmoprotectants (proP and proW), proteases (yaeL) and mRNA degradation (pnp). All these genes were highly up-regulated during protein production with the T7 promoter (rhIFN-β and xylanase), whereas these were not significantly affected during protein production with the weaker ara promoter. The large fold changes in the genes associated with transport is an indication of cellular shutdown. Simultaneously the cell loses its osmotolerant property along with an increase in protease and mRNA degradation activity. We can therefore conclude that both the nature and level of recombinant protein expression leads to the generation of a common as well as a differential stress response. Host cell engineering should take into account the nature of protein to be expressed for designing improved platforms for over-expression. Financial support by Department of Biotechnology, Department of Science and Technology Purse, Council of Scientific and Industrial Research, Government of India is deeply acknowledged.